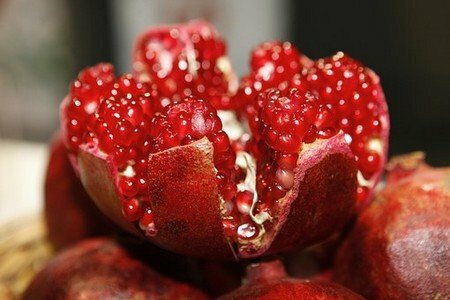 Lukewarm water and pomegranate are the two things that are very much beneficial for the health of human being. Pomegranate is a seasonal fruit of India and Pakistan. Its seeds are so much beneficial to your heart that you may call every seed of pomegranate in your stomach is the seed of life for your heart. Prepare the decoction of dried seeds of pomegranate by boiling in half a liter of water for 10-12 minutes, squeezed the seeds and strained. If one glass of this lukewarm decoction is taken in the morning on empty stomach by the patients suffering from angina pain they will feel relief in tightness and heaviness of chest and also in pain. This decoction is beneficial in all types of heart problem. In the case of the blockage in the coronary arteries, if 200-250 grams of fresh pomegranate juice is taken every day for one year, it will reverse the plaque build-up and unblock the arteries to normal position. The person suffering from this type of heart problem may feel relief from the symptoms within three to four week. Taking fresh pomegranate juice or eating the whole pomegranate on empty stomach in the morning may help in curing the cardiac patient but above-mentioned decoction of pomegranates dried seeds are more effective. Use of this fruit in any form works as a blood thinner, lower LDL known as bad cholesterol and raises HDL known as good cholesterol (high-density lipoprotein). This fruit is beneficial in all types of heart problem. Eating pomegranate with a healthy lifestyle and good eating habits may give amazing results in curing all types of’ heart problems. Regular exercises/yoga is essential to maintain the strength, flexibility, endurance, and balance of the body. Good eating habits mean a balanced diet that includes wholesome and nutritious diets, fruits, vegetables, milk products, and some dry fruits. Avoiding junk and spicy food, reducing of intake of fats in the meals will help to keep cholesterol and triglycerides in control. Taking meals at fixed times and taking dinner at least two hours before sleeping time is also part of a healthy lifestyle and good eating habits. Use of this fruit with a healthy lifestyle and eating habits will help heart patients in thinning of blood, dissolving of blood clots and obstruction inside the coronary arteries. It will also help in maintaining optimum blood flow, healthy blood pressure and preventing thickening of the internal lining of the blood vessels. You may say that a pomegranate a day keeps a cardiologist away.